In January 2013 I wrote about what I do to have winter carrots. I begin in the fall of the previous year and plant rye in rows in my future carrot bed. The rye crop is allowed to mature all the way to seed, which around here in zone 7 is mid-June. When it is cut, the harvest is seed and straw. I lightly hoe between the rows of stubble and plant carrots. I keep this bed well watered to get the carrots off to a good start and replant if there are spots lacking good germination. Once everything is growing well the only attention is to weed periodically. The stubble decomposes, gently feeding back the soil for the carrots. 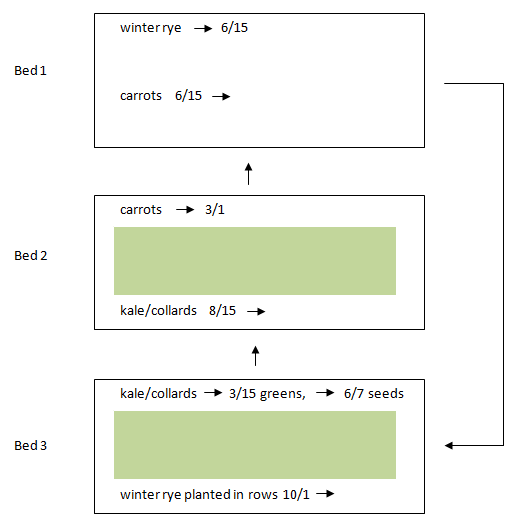 With this post I thought I would show the carrots in a three bed rotation plan that provides greens and carrots for my household through the fall and winter months, while feeding back the soil with cover crops. If you have trouble reading the text on the garden map, click on it and it will open up in a new window, as will all my photos. I grow all of my compost and mulch materials in order to avoid bringing damaging materials into my garden. In the photo you can see the skeleton of this plan. The carrots and kale and collards take up 43% of the space for the year in the total of the three beds. There are 12 bed crop months in each bed for a total of 36 bed crop months. The carrots and greens use 15.5 bed crop months, or 43%. When I plan cover crops I like to have 60% of the bed crop months in the garden in soil building crops. That would mean that the rest of the space in the three beds would need to be devoted to cover crops, plus I need to have some extra in the rest of the garden to make up for the shortage here. The winter rye that is already part of the rotation is a cover crop. 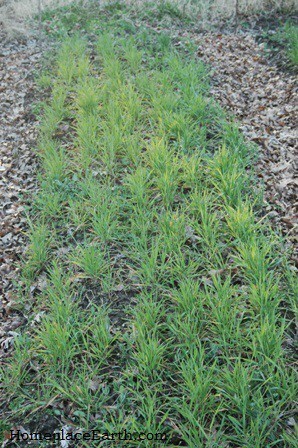 Rye planted in rows in preparation for carrots to be planted into the stubble the following June. The map you see is for the calendar year, showing the crops that are already in each bed at the beginning of the year. The green areas in the plan show when each bed is available for crops beyond the carrots and greens winter food plan. There is a lot of flexibility here. First I will give suggestions for filling those areas with cover crops. Bed 1 is already filled all twelve months, so look at Bed 2. You will harvest carrots from the fall until you have pulled them all or the weather warms in March and they start sending up a seed stalk. If you still have some then, pull them and store them in plastic bags in the fridge and you can have carrots for weeks in your kitchen. If you want to save seed, leave some of the carrots in the garden to go to seed. That might take until July so you may want to have those on one side of the bed, leaving the rest of the bed for something else. Only save from one variety to avoid crossing. My plan shows the carrots are there until March 1. That could vary and they could be there until they show signs of bolting. For a soil building crop you could plant fava beans or field peas. Favas and field pea plants can be harvested as green biomass for the compost pile when they reach full flower. In my area the blooms of fava beans tend to fall off when the weather gets hot, making it hard to save seed anyway. If you take them while blooming, you could follow with another legume, such as cowpeas or soybeans for biomass. Buckwheat can be planted anytime in there to keep the bed planted and to attract beneficial insects. The goal is to have the bed free by the middle of August for the kale and collard transplants that will overwinter. It helps to put a low tunnel on this bed then. 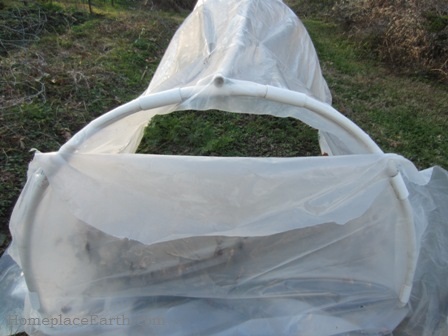 It provides a frame for shade cloth at transplanting that is replaced by a plastic cover when the weather warrants. This low tunnel can be moved from one bed to the other to follow the brassicas crop. Greens and roots for winter food. In Bed 3 you can see that it begins the calendar year with kale and collards already there, left from last year’s planting. That group of crops (carrots early and kale/collards late) were planted in Bed 3 the previous year as you can see by the rotation arrows, leaving the kale/collards there to overwinter. If the harvest is for greens only, the bed will be ready for the next crop in mid-March. If you intend to save seeds from either kale or collards, those plants will be in the bed until June. Favas or field peas are an option for this bed, but so is spring wheat. That could be followed by cowpeas (or another legume), then buckwheat before it is time to plant the winter rye. In my area rye can go in anytime in October. Plant the rye in rows as to make the carrot planting easier. You can see by the rotation arrows that the crops in Bed 1 will rotate to Bed 3 in the next year and conveniently, the rye will be there, right on schedule. If you have plenty of compost materials from the other beds in your garden you might prefer to plant crops for eating in those green spaces on the map. In that case, salad crops such as sugar snap peas, lettuce, spinach, and bunching onions could be planted after the carrots or kale and collards. Those crops could be followed by snap beans. Bed 2 needs to be open by mid-August, but you have into the fall in Bed 3 leaving the possibility of planting sweet potatoes in late May/early June after the salad crops. Winter squash is a possibility in Bed 3 and you can use the rye straw harvested from Bed 1 as mulch. Potatoes followed by snap beans could happen in either bed. Of course, the timing of these crops depends on your location. If you enjoy going to the farmers market for fresh vegetables or belong to a summer CSA, but also like to garden, you may want to consider this winter food plan. It might do well for those of you who like to travel in the summer, as long as you are around for the key planting times. You will find other garden maps and plans in my book Grow a Sustainable Diet. Once you learn how to plan for the whole year, the possibilities are endless. I will be talking about all of this on Saturday, January 31, 2015 in the presentation that Ira Wallace, of Southern Exposure Seed Exchange, and I are giving at the Virginia Biological Farming Conference in Richmond, VA. Come and see us! 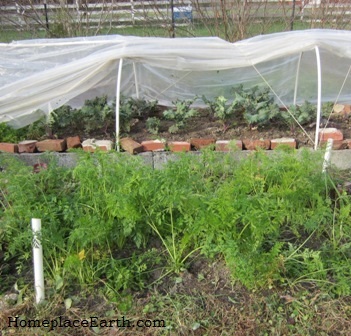 Season extension structures resembling low tunnels are a great way to protect overwintering vegetables. I use them to have fresh greens—kale, collards, and chard—on the table through the winter months. They are easy to build with plastic pipe and either clear plastic sheeting or greenhouse plastic. I would love to not have any plastic in my garden, but until I have a better alternative, I make an exception for this. Plastic pipe easily bends to form the arches that hold up the plastic cover. My garden beds are 4’ wide and I use an 8’ length of plastic pipe (1/2” inside diameter) for each arch, giving me a tunnel with a height of about 30”. Some people use metal electrical conduit for their arches, bending them around a homemade jig. I space the arches about 4’ apart down the length of the bed. Another piece of plastic pipe is put on top, becoming a ridge pole to connect the arches. A screw is used to attach the ridge pole to the top of each arch. It is important to have the ridge pole. My arches are held in place by either putting them over pieces of rebar extending up from the ground or by inserting them into larger pieces of plastic pipe, also extending up from the ground. Whether rebar or larger plastic pipe is used, the pieces of each are cut to 2’ lengths. Plastic pipe can be cut easy enough and you can buy rebar already cut into 2’ lengths. Look for rebar where cement blocks are sold. One foot of each anchor piece is driven into the ground, leaving 12” sticking up to receive the end of the arch. Next comes the plastic cover. You can find clear plastic sheeting in a hardware store or big box building supply store (look for it in the paint department). Make sure it is 6 ml thick to withstand the winter weather. This construction plastic has no UV protection, but since you are only using it through the cold months, you can get a couple years use out of it if you store it out of the sun and keep the mice away during the off-season. Greenhouse plastic is good if you can get it since it will last longer. If you are building a structure that will be in the weather all year long, go with greenhouse plastic. A piece 10’ wide is good to go over the 8’ arches covering my 4’ wide beds. The easiest way to secure the plastic cover to the pipes is with plastic clips, called garden clips or snap clamps, that are sold for this purpose. Johnny’s sells them and they are available at other garden and greenhouse supply sources. You can make some from plastic pipe, but if you need to take them on and off, the ones you buy are easier to work with. Okay, I know it is December already and if you had greens to protect, most likely you have already put up a structure like this if you intended to. I’m really writing this post to talk about the covers. You can build a low tunnel from these directions, but if you stop here you will have problems when the wind picks up or when it comes to harvesting from your tunnel through the winter. Screw eye inserted into arch secures row cover cord. The plastic covers on my low tunnels stick out 12” on the sides. Some gardeners put sand bags, rocks, or pieces of wood on that extra to hold the cover down. On a calm day, it might seem to do the job, but the wind will easily whip the plastic out from under these things. Besides, if you have 18” wide paths like I do, there is no extra room for sandbags, rocks, or pieces of wood. You will be tripping over these long after the covers were removed in the spring, unless you are diligent in taking them up. It would take putting many clips across each arch to secure your plastic cover enough to hold it through high winds. Even if you were willing to work with that many clips, you need to be able to access the plants inside through the season and it isn’t practical to be messing with so many fasteners each time. My solution is to put a cord across from one arch to the next, alternating sides. You need the ridge pole to hold the cord up. I usually use 1/8” nylon cord found in hardware/building supply stores, but have used old clothesline if that was available. If you already have a low tunnel and have experienced problems with wind, you can add this feature and alleviate problems the rest of the winter. It involves putting a screw eye near the base of each pipe the cord attaches to. I use a drill to make a pilot hole for the screw eye. The bungee provides tension to hold the cord securely to the cover. Years ago when I first did this I thought I needed to build a wood box and use pipe clamps to hold the arches, screwing the screw eye into the wood beside the pipe. Later I discovered that it is fine putting the screw eye directly into the plastic pipe. Of course, there is more material to screw into if there are two layers of pipe (the anchor pipe and the arch pipe), but it also works well if the arch is put over rebar. I have not put a screw eye into a metal pipe, but I imagine it would work well, also. If anyone has done that, I welcome your comments. Using a bungee cord between the screw eye on one end arch and the cord helps to apply tension to the cord. The cord holds the plastic sheeting in place for venting or harvesting. There are so many great things about securing the cover this way. Most importantly, it doesn’t come off in the wind. Another advantage is that all those things you put in the path to hold the plastic down are not necessary anymore. And the harvest—it is so easy! 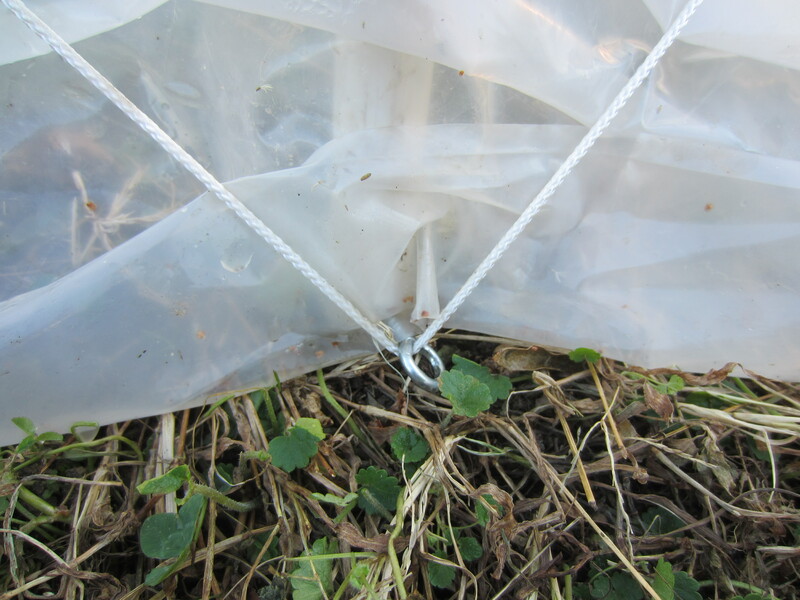 You can lift the plastic at any point along the sides to harvest and it is held in place under the cord. You will still use clips, but only on the end arches. The cover can be cut to come a few inches over the end arches and be secured with the clips. A separate piece of plastic sheeting can be cut to fit the ends. In mild weather it can be left off. When it is needed, it can be secured with the same clip that holds the tunnel plastic, holding two pieces at once. There are so many ventilation advantages with a separate end piece. Once the weather gets severe enough for me to put on the end pieces, I will fold the top edge down for ventilation on the warmer winter days. Venting the row cover ends. I got the idea for using a cord over the plastic cover from Eliot Coleman in his book Four Season Harvest. He used wire arches with a loop bent into it to anchor the cord. Arches from plastic or metal pipe with a ridge pole can withstand more severe weather than the wire arches he described. 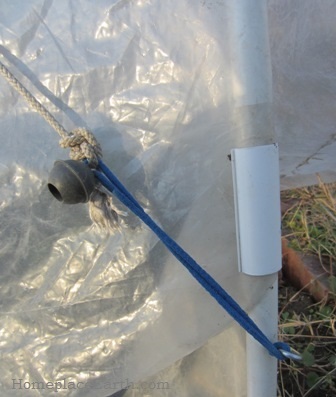 If you have been having trouble with the plastic covers on your row tunnels and haven’t used a cord to secure them, take the time on a mild day to go out to your garden and make the upgrade. You will be happy you did. The first hard frost of fall has come. I think it happened here on October 24. I can’t say for sure because I was in Ohio visiting family. I knew the seasons would be changing in the eight days I would be gone. In preparation for leaving I was busy cleaning up the garden, which goes hand in hand with building compost piles, and planting cover crops. When I returned on October 30 the leaves on the trees had changed colors and the newly planted cover crop seeds had sprouted. When the first hard frost comes in the fall, everything changes in the garden. The pepper plants that were so lush the day before are now wilted, along with so many other warm weather crops. That doesn’t mean your garden is finished for the season, however. This is the time for the cold weather crops to take center stage. I look forward to the frost bringing out the sweetness in the carrots and greens. In fact, I don’t worry about growing carrots to harvest in the summer anymore because we are so spoiled with the ones we have in the cold months. For the next six months we will have sweet carrots fresh from the garden. I’ve previously written about how I grow my winter carrots. Other fall and winter crops that we eat fresh from the garden are beets, Jerusalem artichokes, collards, kale, chard, and parsley. There are more root crops that I could add to the list, if I had grown them this year. Those crops are turnips, Daikon radish, and kohlrabi. No doubt, some of my readers could add more choices. With onions and garlic, potatoes, sweet potatoes, cowpeas, and peanuts from stored harvests, there is a wealth of food one can eat without further preservation. Our winters here in Zone 7 are not so mild that we don’t need protection for the greens if we want to have a continual harvest. Even at that, picking once a week is what to expect, and less frequently during the weeks of the least daylight, so more area needs to be planted for winter harvest than needed for a spring planting. I don’t cover the carrots and beets with anything so as not to encourage voles to move in. They are planted early enough to be mature now, so only need to be held in cold storage in the soil. 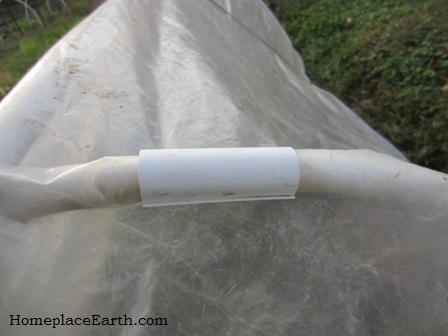 For protection from harsh winter weather for the greens I use low tunnels made from plastic pipe and old greenhouse plastic. This type of cover is easy to erect. The ½” plastic pipe can be inserted into larger size plastic pipe stuck in the ground or put over pieces of rebar. The rebar and larger plastic pipe is cut to 2’ lengths and put half in and half out of the ground. If you leave rebar in the ground without a hoop over it, be sure to cover it with a plastic bottle, piece of plastic pipe, or an old tennis ball. You don’t want anyone to get hurt if they stumble upon it. You can find rebar precut to various lengths in the building supply stores near the cement blocks. Plastic pipe comes in 10’ lengths. I cut it to 8’ to form a hoop over a 4’ wide bed. These pipe structures also have a pipe across the top and a cord (anchored to the bottom of the hoops) that goes over the plastic cover to keep it in place. More details about that are at my blog post Managing a Cold Frame, Low Tunnel, or Mini-greenhouse. The plastic is held to the end hoops with clips made especially for that purpose. They are nice to have. Having this bounty of food available in my garden all winter is the result of careful planning done sometimes a year in advance. To have the cabbage family greens at a good size now is sometimes a challenge, since they would have been started during hot weather. I have to keep a vigilant watch to pick off cabbage worms and harlequin bugs during those weeks. The seeds are started in the coldframe, not because they need protection, but because the coldframes are my seed starting areas. 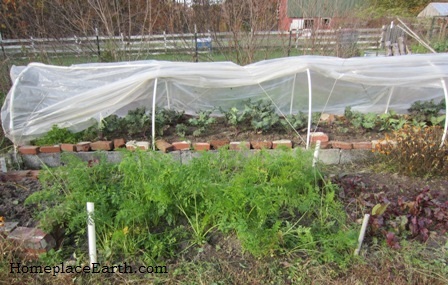 I do, however, sometimes cover the coldframe with a shadecloth if the weather is too hot and sunny. Once established, the best plants are transplanted to the garden beds. The winter covers don’t go on until cold weather hits. I’m just now bringing the covers out. A big advantage of using this type of low cover, rather than a greenhouse, is that the covers are easily added, removed, or vented, allowing the plants to get the full benefit of the natural climate, including the rain. 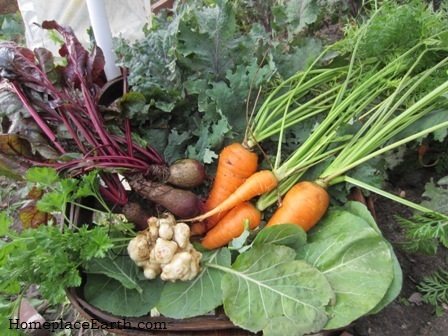 If you don’t have this variety of food available in your garden after the frost, and would like to, start making notes now and work on your garden plan to make it happen next year. Go ahead and prepare a bed and put a cover on it now, or at least put up the hoops and be ready for a cover. In late winter you can use it to get off to an early start. Put the cover on two weeks before your planting time to warm the soil. When my community college students planned a season extension structure for their projects, many of them constructed their designs, but put in transplants and seeds too late for a fall or winter harvest. However, often they found they had a very early spring harvest from those plants, especially with things like spinach. If you have the time and inclination to prepare now, it will put you one step ahead for early planting next spring. This is the fourth year, of the past five, that I’ve eaten only what I’ve grown on the Fridays in Lent. I call these days Homegrown Fridays. I find that it deepens my understanding of what it takes to feed ourselves when I limit myself to only what I’ve grown. By this time of year stored food supplies are diminished and the garden is not quite awake. Our garden and food preservation program has evolved to depend on staple crops that can be stored, rather than canned or frozen. Although I did do a little canning this year, most of the things that couldn’t be stored properly to keep were dried in our solar food dryers. In the photo you will see one of our Homegrown Friday dinners. 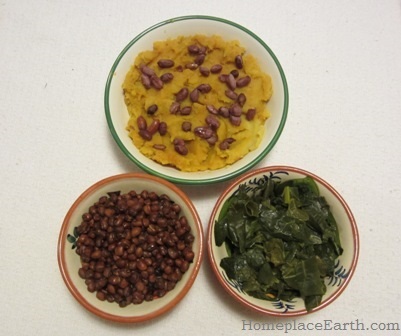 It consisted of cowpeas, sweet potatoes, peanuts, and collards fresh from the garden. I often try new things on these days and that day I boiled peanuts. We (my husband and I) decided that eating them raw or roasted was our preference. I depended a lot on peanuts at lunchtime this year. Maybe it was because I seemed to be extra busy on these days. I’d grab some peanuts while sweet potatoes were cooking for lunch. My peanut harvest had picked up in 2012 when I planted some after Austrian winter peas in the rotation. The previous year I had peanuts in a bed following onions and garlic. At harvest time there was a definite difference in the yield in the onion half of the bed compared to the garlic half. Winter peas were the winter cover crop preceding the onion sets that had been planted in the spring. I was pretty sure that the increased peanut yield was due to the winter pea cover crop and not the onions. In 2012 I planted one bed of peanuts after winter peas and one in a bed that had had garlic, onions, and kale. The onions were multipliers and had been there with the garlic and kale since the previous fall. The yield following the Austrian winter peas was three times the one following the alliums and kale. I had a great carrot harvest this winter. You can read about it in my post on Winter Carrots. I also had beets in the garden through the winter. The black walnuts yielded in 2012 so I shelled some and made some oil to put on the carrots and beets when I roasted them. Shelling the walnuts and pressing oil took a long time. I wouldn’t want to depend on that for my cooking oil. Frying locally grown bacon and saving the fat for cooking is a lot easier, but that wasn’t an option for these Fridays, since I hadn’t raised the pig. 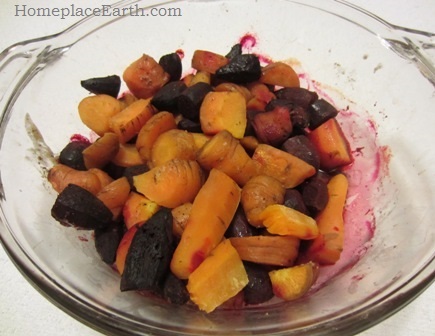 The roasted carrots and beets were delicious. Soup made from dried ingredients is always on the menu during this time. One soup I made had no dried ingredients. 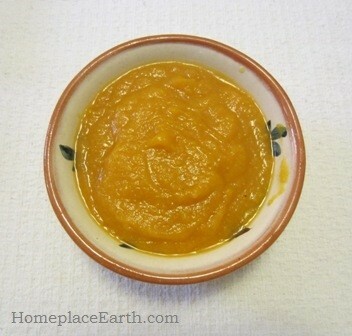 It was made from carrots, butternut squash, and garlic. I cut them up and roasted them—no oil that day. Then I added water and simmered the cut up, roasted vegetables for about 20 minutes. It all went in the blender and resulted in what you see in this third picture. It was good, but a little bit of dairy added—sour cream, yogurt, or milk—would have been nice. Onions would have been a good addition, but I was down to my dried onions and they were in short supply. Dried onions went into bean burgers using the same recipe as I did in 2012. Our staples for these meals from stored crops were sweet potatoes, peanuts, cowpeas, garlic, sorghum (for flour) and corn (for cornmeal). Fresh from the garden came collards, kale, carrots, and beets. I ground Bloody Butcher corn to make cornmeal mush for breakfast. We have chickens, so we have eggs. I use an egg or two occasionally on Homegrown Fridays, but not much because I don’t grow all the feed for the chickens. Since some of their nutrition comes from our property, an occasional egg is included. Dried tomatoes were important for sauce and other dried vegetables and herbs provided variety in our meals. I’ve already written about our new tea ingredient—Red Thai Roselle Hibiscus. With such a great honey harvest last year we could sweeten our cornmeal mush. Unfortunately, our two beehives didn’t make it through the winter, so I’ll be looking for new bees this year. We had mead made from our honey and grapes, and popcorn cooked without oil. Observing Homegrown Fridays at this time of year makes me more determined to work out my vole problem with the potatoes to make sure I have enough to last through the winter. I’m also acutely aware that I need to up my wheat harvest. I had an interesting conversation with Eli Rogosa of the Heritage Wheat Conservancy in January while I was preparing an article for Mother Earth News that will appear in the June/July 2013 issue. Eli filled me in on heritage wheat and how to grow it. A chart with her recommended varieties for each region of the U.S. will appear in the article. A chart with crops I’ve mentioned here and varieties recommended for each region will also be included in the article. You will be interested in that article if you want to grow staple crops for your meals. If you have done any of this, even in a small way, I welcome your comments. It is in sharing, both information and food, that we will move forward on this journey. If you were getting most of your food from your garden, the three nutrients you would need to pay particular attention to are calories, protein, and calcium. I’ve already talked about calories and protein, so now I’ll address calcium. The next post (November 27, 2012) will be about something entirely different, I promise. The dairy industry has done a great job of telling people how much calcium is in milk and cheese. Such a great job, in fact, some people might think that’s the only place to get it. You can put calcium on your plate in the form of leafy greens right from your garden. You will also get calcium from the beans you eat. A vegetable that is loaded with calcium is collards at 921 mg per pound. That translates to 357 mg calcium per cup of cooked collard leaves and stems. By comparison, a cup of whole cow’s milk contains 291 mg and a cup of goat’s milk has 326 mg calcium. Parsley has as much calcium per pound as collards. People don’t usually eat as much parsley as they would collards, but it is something to think about. Everything adds up, so including parsley in your recipes will increase the calcium content of those dishes. Kale is a good source of calcium at 601 mg per pound or 206 mg in 1 cup of cooked kale. These numbers come from How To Grow More Vegetables, 8th ed, and The New Laurel’s Kitchen. We usually eat steamed kale and collards with some vinegar added. These greens, along with garlic and/or onions cooked in butter or olive oil, are also good as a topping for mashed potatoes. With a low tunnel we can grow collards and kale through the winter here, harvesting about once a week at most. The best over wintered collards I’ve grown were in the 12’x20’ greenhouse I had at one time. Once March hits, these crops realize they are in their second year and send up seed stalks. Leaving at least some of these plants go to seed will attract beneficial insects, as well as give you seeds. You especially need to let your parsley overwinter. It comes back to life early in the spring to put out flowers attracting beneficial insects, just in time to protect the new spring brassica plants in your garden. By the end of March, or even earlier if you are putting them under cover, it is easy enough to have new plants set out. At Ecology Action in Willits, California they grow perennial collards, otherwise known as tree collards. The summer nights are cooler there than here, and the winters aren’t quite as severe. Bountiful Gardens occasionally sells tree collards and has more information in their catalog. I’m not sure tree collards would do as well here. It is good to seek out varieties intended for your region and conditions. Southern Exposure Seed Exchange (SESE) sells Green Glaze and Cascade Glaze collards. The smooth leaves are more resistant to cabbage worm and cabbage looper. Even’ Star farm in Maryland has been breeding collard and kale varieties specifically for winter harvest. You can find the Even’ Star varieties at SESE. There is much more to know about calcium. You need calcium for strong bones and teeth. If you are pregnant and not getting enough calcium, your baby will take it from you. I had a friend who had to have major dental work done each time she was pregnant. No matter how much calcium-laden food you’ve eaten, other factors in your diet can work to block absorption. Not enough fat is one of those factors. You have probably heard that it is important to have enough vitamin D to work with the calcium and you can get vitamin D from being in the sun. However, what you might not know is that D is a fat soluble vitamin, so you need fat as a catalyst to help things along. That means, including some milk and cheese in your diet would be good after all, along with the greens. You could add peanuts and hazelnuts to your crop plan. Peanuts (313 mg/lb) and hazelnuts (948 mg/lb) are sources of calcium and are good sources of fat. I have heard of vegans who suffered broken bones from otherwise minor incidents, as a result of not enough calcium. It might have been not enough calcium absorption. Sugar consumption and stress will relieve your bones and teeth of calcium, but it is best to avoid sugar and stress for so many reasons anyway. According to Nourishing Traditions by Sally Fallon, the best sources of usable calcium are bone broth and dairy products. When that old hen reaches the end of her laying days, make sure you stew up the bones for soup. Phytates in grains might block calcium absorption. Soaking, fermenting, and sprouting will help prevent that. Soaking oatmeal overnight is a good idea. Not only is it better for mineral absorption in your diet, but if you do that, your breakfast is almost ready. It is already in the pan, just turn it on and let it cook while you make your coffee or whatever it is that you do in the morning. It is important that we get our nutrients from the food we eat and that food needs to have been grown in healthy soil. The nutrients in food come naturally packaged with other things necessary for their assimiliation in our bodies. If you rely on supplements, you could be throwing things out of balance. There is so much to know about a healthy diet. Educate yourself and eat a variety of foods from local, sustainable sources. 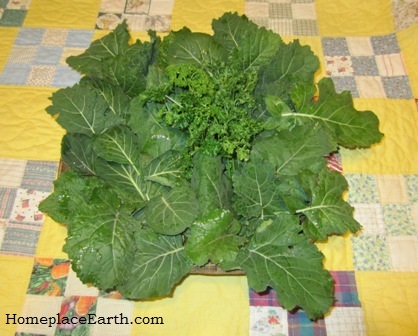 More about Growing Calcium at http://www.motherearthnews.com/permaculture/growing-calcium.aspx.